Also serving communities of Boothwyn. There are 23 Assisted Living Facilities in the Chester area, with 2 in Chester and 21 nearby. The average cost of assisted living in Chester is $3,090 per month. This is lower than the national median of $3,346. To help you with your search, browse the 192 reviews below for assisted living facilities in Chester. On average, consumers rate assisted living in Chester 3.8 out of 5 stars. Better rated regions include Media with an average rating of 4.0 out of 5 stars. Caring.com has helped thousands of families find high-quality senior care. To speak with one of our Family Advisors about assisted living options and costs in Chester, call (855) 863-8283. Promotion ends in 2445 days! Chester is located on the west bank of the Delaware River, about 12 miles southwest of Philadelphia, and its senior population of 11.7 percent is slightly less than Philadelphia's 12.5 percent. Seniors in the Chester area can choose from 29 assisted living facilities, including two in Chester and another 27 in surrounding areas like Media and Woodbury. The regulations regarding assisted living facilities, officially known as assisted living residences, are administered by the Department of Human Services in Pennsylvania. Chester's weather is generally milder than Pennsylvania's more mountainous regions further inland, especially during the winter. The average low temperature in January is 26 degrees, while the average high temperature in July is 87 degrees. Seniors may find the weather in Chester to be comfortable for a relatively large portion of the year. Chester’s cost of living is only 82.5 percent of the national average, which is quite low for this part of the country. However, the extremely low cost of housing accounts for the great majority of this difference. Essential living expenses that will be of greatest interest to seniors are all above the national average, especially utilities. The economic difficulties in Chester have resulted in a very high overall crime rate. The rate of violent crimes is especially high at 15.83 per thousand people per year, as compared to an average of 3.16 for Pennsylvania. Seniors living in Chester should use extreme caution to protect themselves. The Southeastern Pennsylvania Transportation Authority serves Chester with one of its regional rail lines, which originates in Philadelphia, Pennsylvania and ends in Newark, New Jersey. Seniors 65 and over pay only a nominal fare for destinations in Pennsylvania and half the standard fare for destinations in Delaware and New Jersey. These discounts require a senior ID card. The Chester Senior Center maintains a full calendar of activities that includes games such as cards, dominos and bingo. Exercise classes, arts and crafts and adult education are also part of the regular schedule. This senior center also serves hot lunches Monday through Friday. The Chester area is home to world-class medical facilities, including Community Hospital and Crozer Chester Medical Center, in the event of medical emergencies or illness. Assisted Living costs in Chester start around $3,090 per month on average, while the nationwide average cost of assisted living is $4,000 per month, according to the latest figures from Genworth’s Cost of Care Survey. It’s important to note that assisted living rates in Chester and the surrounding suburbs can vary widely based on factors such as location, the level of care needed, apartment size and the types of amenities offered at each community. 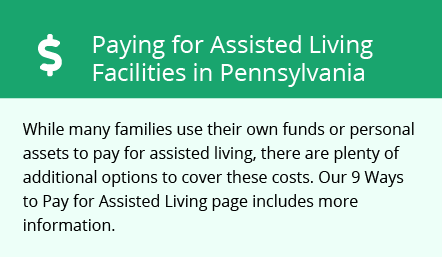 Pennsylvania does not have any programs that help with the costs of assisted living at this time. Social Security Supplemental Income (SSI) may be able to provide some financial help to those who are eligible. Chester and the surrounding area are home to numerous government agencies and non-profit organizations offering help for seniors searching for or currently residing in an assisted living community. These organizations can also provide assistance in a number of other eldercare services such as geriatric care management, elder law advice, estate planning, finding home care and health and wellness programs. To see a list of free assisted living resources in Chester, please visit our Assisted Living in Pennsylvania page. Chester-area assisted living communities must adhere to the comprehensive set of state laws and regulations that all assisted living communities in Pennsylvania are required to follow. Visit our Assisted Living in Pennsylvania page for more information about these laws.